This weekend Raghu Iyer just failed to qualify for the National Final of the All England AC Handicap competition. He tied for third place with three wins from his five games, only missing out on the crucial fourth victory by a single point, that would have earned him a Finals berth. Nevertheless, this was the first time Phyllis Court have been represented in this competition for many a year, and quite possibly Raghu's achievement is unique! 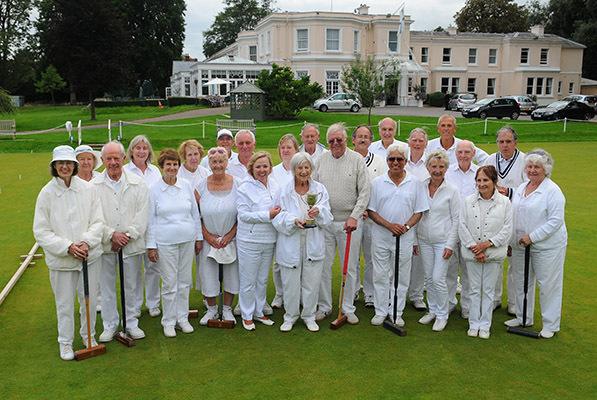 The Croquet Club won the annual Bridge v Croquet tournament today, for the second year running. Trailing 10-26 after a morning's bridge superbly run by David Young, the Croquet Club slowly reeled in the Bridge Section's lead over five rounds of doubles croquet to leave the scores level with one round to play. The match result was in doubt right up to the last hoop of the last game to finish and it was Roger Goldring and partner Christine Searle who won that game 4-3 and so secured a Croquet a 37-35 winning shoreline score line for Croquet. 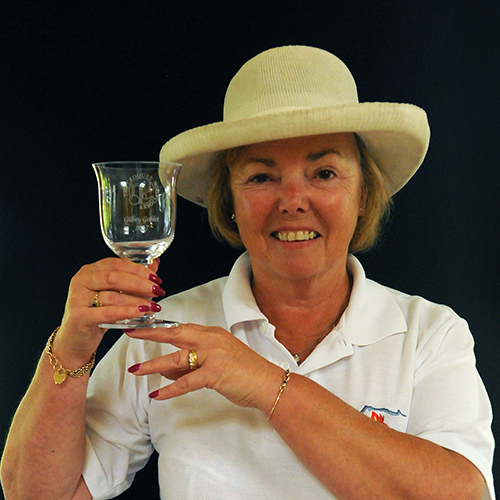 Eileen Collins was a popular choice to receive the Connel Gimwood Cup on behalf of Croquet. Croquet: Ian & Delia, Colin & Raghu, Christine & Roger, Deon & Ray B, Pauline & Joanna, Frances & Eileen. Bridge: Robin M & Suzanne, David Y & Michael C, Dianne & Dale, Pilar & Helen, Robin C & Edmund, Kathy & Margaret. Frances Colman won the delayed final of the Gilbey AC Handicap at Roehampton today when she soundly beat Watford's Andre Michel +24. 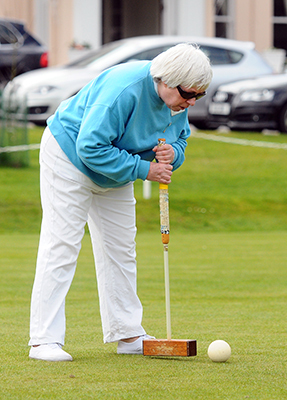 She therefore gets her name on another of the Croquet Association's three most historic 'rolls of honour', but she had to wait an extra four days to do it, due to flooded courts on the last day of play at Budleigh Salterton last week. With the agreement of the manager, the final was played closer to home for both finalists who chose Roehampton for the encounter. The Challenge and Gilbey tournaments date back to 1900 and 1920 respectively, and have been run as joint exercise since being first brought together in 1923. I don't think there were contests during WWII so Frances becomes the 89th winner of the Gilbey Goblet and is pictured here 'all smiles' and rightly so - congratulations Frances! 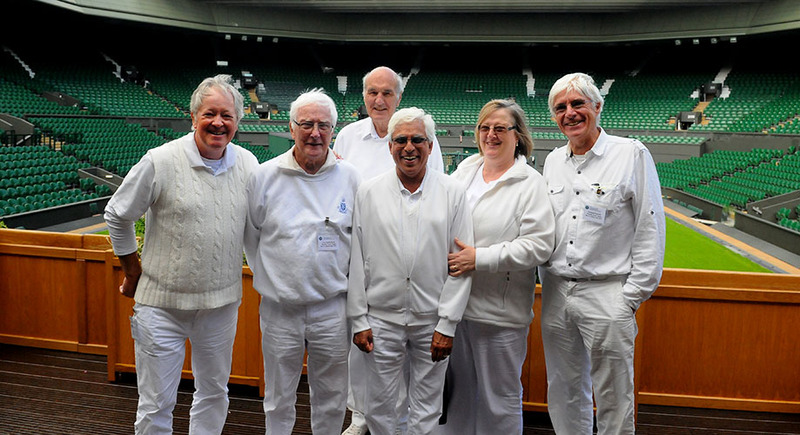 A Phyllis Court friendly team of six GC and AC players convened at the home of British tennis for a lovely day with our hosts from the All England Club, Wimbledon today. This is of course where our own sport of croquet was first administered back in the 1870 and 1880's, long before the 'new sport' of tennis was invented. Although we played our match down the road from the main tennis complex, were treated to a lovely lunch and tour the tennis HQ which included the players' locker rooms, the history walk past photographs of every single champion and then posed for a 'team photograph in the Royal Box overlooking Centre Court. We also saw our names in lights in the wall of the main entrance lobby and were shown the original winners' honours boards that featured W.H.Peel as the first club champion (and it is his name from which we get the croquet term 'Peeling'). Either side of all that, we played some croquet; won the GC 5-3 and lost the AC 0-2, thereby ensuring a very pleasing 5-5 draw. Congratulations to Helena Fensome and Pam Mead who won the Open Doubles season-long competition today. They defeated Ian and Delia Norris in, what reads like, a closely fought final 7-6, 7-5. This win reprises their previous success in 2015 and for 'Team Norris' was their third runner-up prize as the final hurdle remained just insurmountable again. This the first of or seven competitions to have reached its conclusion this year, so well done everyone on that score as well. 12 Sept - Coates reaches another final and earns yet another handicap reduction! Robin Coates successful season seems to know no bounds - today news reaches us that he beat Colin Morgan in the semi-fails of the Hnadicap Singles season-long competition, and so qualifies for his third final (he is already in the finals of the 3+ Singles and 7+ Doubles partnering Christine Searle). He has also earned enough points to 'trigger' a FOURTH handicap reduction this year and is now down to the 5 mark – this is really well done Robin. Standing in his way in the Handicap final will be the experienced Mike Fensome, who qualified some time ago. Chris Roberts and Roger Goldring travel to Nottingham this weekend for the second most prestigious GC event in the Croquet Association's year. The English National Singles Championship is second only to the British Open in the hirearchy of GC Tournaments. That Phyllis Court have two players qualified for this, is another feather in our Club's cap. Roberts is seeded 7th and Goldring 13th in the filed of 16, where half the field will qualify for the Championship knock-out on day 2 after day 1 block games. 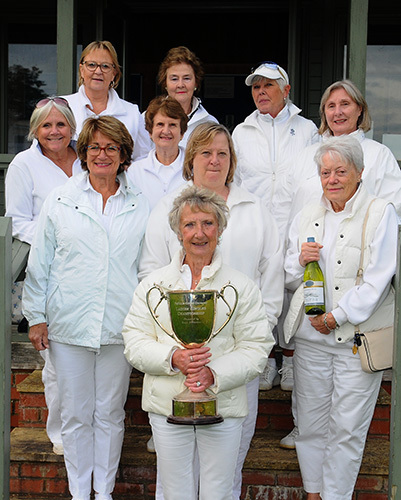 14 Sept - Peperell wins Hurlingham Vets giving PCC two titles in a row! 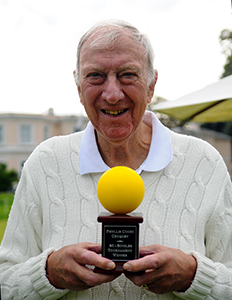 Richard Peperell was undefeated in three days play and took the Hurlingham AC Veterans title with six straight wins. 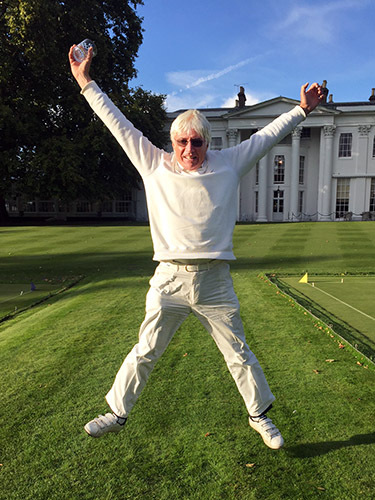 He celebrated with his winners whiskey tumbler by doing another of his trademark star jumps in front of the prestigious Hurlingham House. Last year's winner Frances Colman was on hand to take the photo, having lost narrowly to Peperell in what was effectively a semi-final. She ended up with three wins and Raghu Iyer, who like Peperell was making his debut in the event, came back from four defeats to win both his games on the last day. Peperell's string of wins reduces his AC handicap again, and he is now on 8 - congratulations Richard. Raymond Wood will get his name on a second trophy that he'd not won before, thanks to remaining undefeated to win the 80+ Singles tournament today. He faced tough opposition from his 'bogeyman' Don Rutherford who should have won thier morning block encounter, but missed a relativley easy hoop 13 clincher. The pair progressed to opposite semi-finals where they met Robiin Morrell (also undefeated) and Colin Morgan. Wood beat Morrell and Rutherford beat Morgan by the same 7-5 scoreline, to set up a re-match final. This time however, ther was no lst hoop drame and Wood controlled the game to win 7-3 and hoist the Yellow Ball Trophy. Delia Norris sprang a surprise today when her calm collected play was rewarded by six straight wins and victory in the Ladies Singles tournament. It would be fair to say that she had the 'run of the balls' in the final round of the 'Swiss' format event, against favourite Helena Fensome, who was herself undefeated going into the last round. Delia established and early lead and held her nerve to win 7-4 and lift the Ladies Singles Cup for the second time. There have only been three different winners in the five years of this tournament; Norris & Fensome (two wins each) and Pam Mead, who was the first winner. Di Pascoe won the side event 'wine'prize' for the most index points won on the day. It was most pleasing to see and increase in participation this season with 11 Ladies taking part, and especially so to welcome Elizabeth Hickling, Shirley Parnis and Mella Waterhouse to their first Singles tournament. The whole day was 'virtually hosted' (from Florida) by the wonderful generosity of Rosie Richardson, and by Ann Norman who (representing Rosie in person), presented the Cup to Delia. Rosie treated everyone to mid-morning coffee and a super full afternoon high tea with Prosecco at the end of proceedings. Everyone toasted Rosie in her absence and, if you are reading this in America Rosie; we all thank you very much indeed. There was disappointment for Chris Roberts but satisfaction for Roger Goldring at the English National Singles Championship Final this weekend at Nottingham. Seventh seed Roberts lost all six of his games on Saturday, recovered to win everything on Sunday an won the 'Plate' event, but 9th place overall was 'less than an okay return' for him. Roger Goldring out-performed his thirteenth seeding to finish a pleasing 11th overall having given England international players Lionel Tibble and Tobi Savage two very close matches. Ralph Chambers was runner-up last season but went one better this evening when he won the 7+ season-long competion. He beat John Maguire, who has also had a good season, 7-4, 7-4. Chambers wind the Suzanne Roberts Quaich and maguire the Colman Quaich. - Congratulations Ralph. It is with sadness that I have to inform you that our member Dr. Helen Walker passed away on Tueday at a nursing home near Didcot. Helen was also a member at Harwell Croquet Club where she was the club secretary until her illness took hold earlier this year. left alone but always had a friend with her from her church. Court on space and black holes. Helen will be remembered at Phyllis Court by our longer standing members, and particularly those playing AC, which was her preference. Our Brian Bucknall has fond memories of Helen who "was a lovely person and we shared many happy games together". Helen was 64. She will be much missed. Helen’s funeral has been arranged on Monday 9 October at 11.30 at her church, All Saints, Didcot. The time is nearly upon them - the biggest games of their croquet careers! Michael Christmas and Deon Melck will be Phyllis Courts representatives in the CA's 8+ competition National Final on Sunday. The event is called the 'Grass Roots' and will be held at Nottingham, which is one of the leading clubs in the county. Christmas and Melck earned the right to attend by achieving high placed finishes in our own inaugural 8+ tournament earlier in the season. The very best of luck to you chaps! Robin Coates ran away with our handicap competition final in what looks like a quick-time time today. He beat Mike Fensome (who was conceding 4 extra turns each game) 7-0, 7-3, and so wrapped up an impressive competition where, despite a few close shaves, he didn't drop a single game. Hard lines Mike; handicap play is to the advantage of the rapidly improving player and Robin, you certainly are our 'most improved player' this season. Robin has achieved a very unusual four handicap reductions this season and has steadily added tactical nouse to his very steady straight hitting. - Congratulations Robin. Michael Christmas and Deon Melck found it tough going at the Croquet Association's 8+ national final yesterday. Christmas lost out 6-7 in three of his block games and Melck registered their only win. Lower places were duly contested in this 'Grass Roots' competition final at Nottingham. In what sounds like a remarkable game this afternoon, Richard Peperell recovered from a disastrous start to win our GC 3+ season-long competition. Our newly crowned handicap champion Robin Coates (5) got off to a great start and established a 0 - 4 lead over favourite Peperell (2) which three long range hops and a touch of good fortune with an 'in-off'. Peperell clawed his way back on equal terms but lost the first game 6 - 7 when Coates put in an excellent first ball approach. Given the closeness of the first game, it was a surprise that Peperell won the second with ease 7 - 0, before the decider was again a close affair won 7 - 5 by Peperell, giving him the 3+ title for the first time. - Congratulations Richard. Ian Norris capped his best season yet a maiden victory over Charlie von Schmieder to win our top ranked Open Singles competition for the first time. He had already denied Chris Roberts an eight consecutive final with a good comeback victory in the semis (5-7, 7-5, 7-5) and he showed similar steel today when taken to a third game by six times champion von Schmieder. Norris, who has added much stronger clearences to his pin-point ball placement skill, won 7-5, 3-7, 7-5 to put a new name on our GC Champion Trophy, so breaking the von Schmieder / Roberts eight year duopoly. - Congratulations Ian. News only just in (from earlier this month). Charlie von Schmieder 'went home' on 8 September and played in the Ireland GC Championship for the first time in a few seasons. And he did tremendously well against a good field and finished runner-up to Ireland number 1 Patsy Fitzgerrald on the last hoop of the deciding game of the final (2-7, 7-5, 6-7).